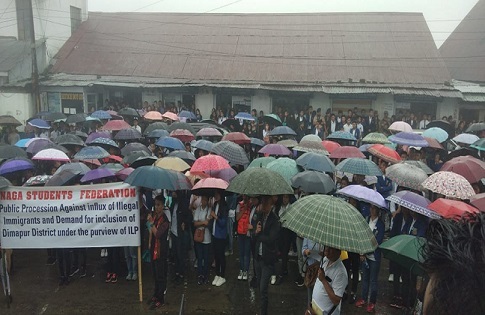 The Naga Students’ Federation (NSF), along with federating units, organised a public rally in Kohima on Friday to protest against influx of illegal immigrants into Nagaland and also to demand inclusion of Dimapur district under the purview of inner-line permit (ILP) system. The students held a short programme outside the NSF office in Kohima at 10.30 am before taking out the rally. Braving the incessant rain, hundreds of students and members of public marched from NSF office to the chief minister’s official residence to submit a memorandum. The chief minister’s office, in a communiqué, said a delegation comprising the NSF and its federating units, including the All Nagaland College Students’ Union, submitted a memorandum addressed to chief minister Neiphiu Rio on Friday. The memorandum was received by advisor to the chief minister, Viketol Sakhrie. The communiqué said the delegation impressed upon the advisor about the existing exigency regarding stringent implementation of ILP, including the need to bring Dimapur under its purview, to check illegal immigration into the state. The student leaders also highlighted in brief their activities in checking ILP defaulters and appealed to the state government to take all necessary measures in this regard, particularly by streamlining the ILP issuing mechanisms and sensitising the various district administrations in the state on the matter. The advisor to the chief minister appreciated the concern and efforts of the student bodies in addressing the problem. He also conveyed the chief minister’s concern on the matter. Sakhrie told the student leaders that the influx of illegal immigrants was a common problem and has the potential to impact our future generations. He emphasized the urgent need for all sections of the society to work collectively to address the problem for the sake of posterity. On behalf of the chief minister and the state government, the advisor assured that the state government was working with all seriousness on the matter. He added the chief minister will call for a joint consultative meeting with all stakeholders in the near future.